In fact, the Canon XC15 recording video format MXF, a self-container format, which is not an ideal format for most editing software such as Adobe Premiere Pro. And from Adobe Premiere Pro official website you will know that it can support MPEG-2 encoded MOV files well, and MPEG-2 codec is the native codec for Adobe Premiere Pro. In this case, for the purpose of helping XC15 owners get rid of this trouble, here I will take the UFUSoft MXF Converter for Mac as example to show you how to transcode Canon XC15 4K XF-AVC MXF to MPEG-2 video for smooth editing in Premiere Pro. This program can easily transcode Canon MXF files to Premiere Pro highly compatible MPEG-2 codec from XC15 as well as XC10, C500, C300 Mark II, C300, XF305, XF100, XF300… without quality loss. In addition, it also offers other optimized codec for non-linear editing programs, such as AIC for iMovie, DNxHD for Avid, ProRes for FCP .etc. Moreover, it also is a professional video editing software to assist users with trimming, cropping, splitting, merging attaching subtitles… to create your own videos. If you are a Windows user, you can turn to the UFUSoft 4K video converter for help. How to convert Canon XC15 4K XF-AVC MXF to Adobe Premiere Pro? 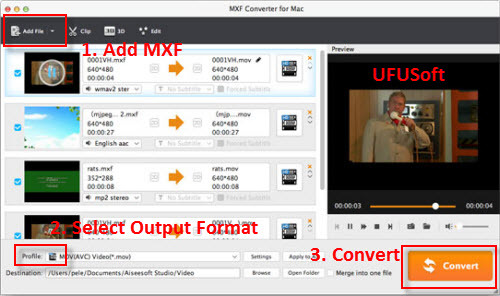 Launch the program and click “Add” button to import the Canon XC15 4K XF-AVC MXF files to the top MXF to MPEG-2 Converter Mac. Batch conversion is supported. Go to “Format” menu and choose Adobe Premiere/Sony Vegas -> MPEG-2(*.mpg) as target format for using XC15 4K MXF in Adobe Premiere Pro. Step 3. When the former steps finished, you can press “Convert” button to start rewrapping Canon XC15 4K MXF files to MPEG-2 for Adobe Premiere Pro on Mac OS X. Once the conversion process is done, click “Open” button to get the generated files. And now import the converted Canon XC15 MXF files to Premiere Pro CC/CS6/CS5/CS4 to start editing.